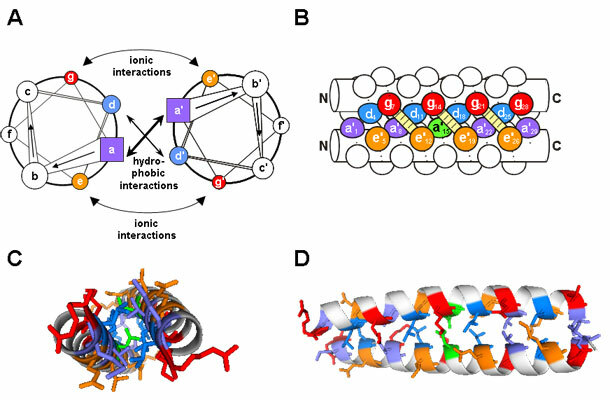 "Semi-rational Design of Jun-Fos Coiled Coils with Increased Affinity: Universal Implications for Leucine Zipper Prediction and Design"
Proc. Natl. Acad. Sci. USA 103(24), 8989-8994, 2006. "Selectional and Mutational Scope of Peptides Sequestering the Jun-Fos Coiled-Coil Domain"
J. Mol. Biol. 381, 73-88, 2008. For more information about coiled coils and our work please visit the Arndt lab home page. IMPORTANT: This is the latest version implementing data from Hagemann et al. For the first version described in the PNAS publication, please refer to this page. Please enter the two sequences in one-letter amino acid code starting at the same helical position (a-g) and select the starting position (a-g). Only 'ACDEFGHIKLMNPQRSTVWY' are allowed for the sequences, whitespaces are ok. Sequences do not have to be named. 3693 visits since March 1, 2010. Dimeric parallel coiled coil. (A) Helical wheel diagram looking down the helix axis from the N- to the C-terminus. Heptad positions are labeled a to g and a’ to g’ respectively. Positions a, d, e and g are color coded. (B) Side view. The helical backbones are represented by cylinders, the side-chains by knobs. The path of the polypeptide chain is indicated by a line wrapped around the cylinders. For simplicity, the supercoiling of the helices is not shown. While residues at positions a (purple) and d (blue) make up the hydrophobic interface, residues at positions e (orange) and g (red) pack against the hydrophobic core. They can participate in interhelical electrostatic interactions between residue i (g position) of one helix and residue i’+5 of the other helix (e’ position, belonging to the next heptad), as indicated by the hatched bars. Indicated is also the core-a position (green) which is often occupied by polar residues mediating specificity. (C) and (D) Coiled coil domain of the yeast transcription factor GCN4 as ribbon plot (PDB code: 1ZTA) to indicate supercoiling and g/e’ interactions. The plot was made using Pymol.